KOUSI uses only the first-class environmentally-friendly material polypropylene resin in its products. It is the first choice of industries that have high standards for product materials, such as baby products, medical devices and instruments, and aseptic packaging. Our mission is to help you keep your home neat, tidy and organized, and to offer ultimate convenience in household organization. This storage unit is simple and easy to assemble and will provide you with a very sturdy, fully functional storage shelf. The shelving is very robust, made from a strong and slightly flexible plastic that can withstand plenty of weight. Anything can be stored, whether it's shoes, clothing, toys, DVDs, or toiletries. 【SPACIOUS STORAGE ORGANIZER】Dimensions: 58.3"(W) x 14"(D) x 58.3"(H). 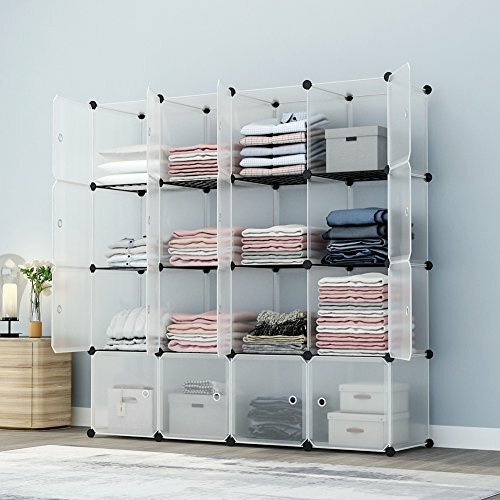 16 storage cubes offer you extra space for all kinds of outfits and belongings.